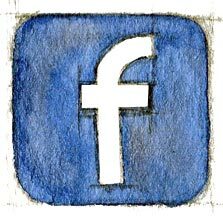 Order my various artwork online. Feel free to contact me for commission work. With dippened ink as my main medium, I use rough rendering to impart the nostalgia these French facades exude, adding only a very few touches of watercolor to breathe life into the stones. 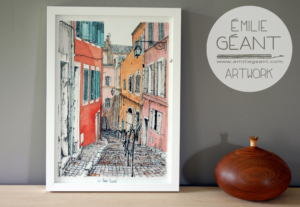 Hand signed and numbered Limited Edition Giclée prints of the Original paintings. 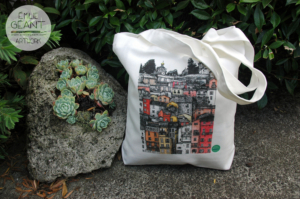 The tote bag features my original inked illustration of Menton, in South of France. The bag has reinforced shoulder straps and one large main compartment. It is a solid 100% cotton (320gsm canvas) and washable. The bag’s measurements are 42cm x 42cm with a 9cm wide gusset for extra space. Professionally printed with love in Bay of Plenty, NZ using direct to garment digital printing. 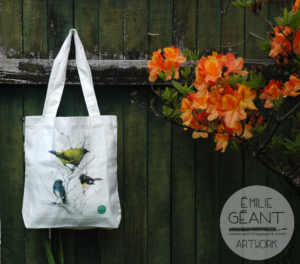 The tote bag features my original illustration of a bellbird, a New Zealand robin and a tomtit, native birds of New Zealand. The bag has reinforced shoulder straps and one large main compartment. 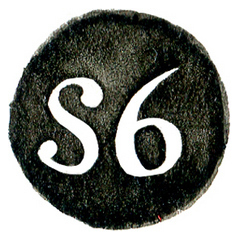 It is a solid 100% cotton (320 GSM canvas) and washable. The bag’s measurements are 42cm x 42cm with a 9cm wide gusset for extra space. 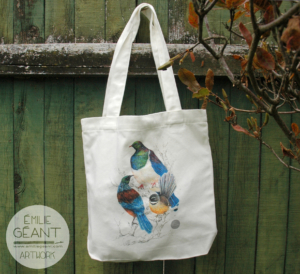 The tote bag features my original illustration of a Tūī, a Fantail and a Kererū, all native birds of New Zealand. A selection of paintings are available in A2 Prints. These ones have been printed on a 300gsm satin paper using UV ink, giving extra protection against fading caused by sunlight*. 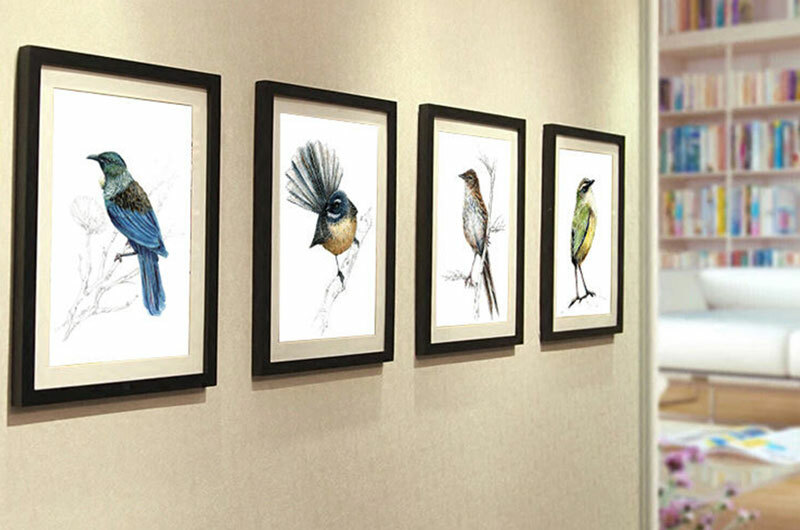 A total of 27 different species are available on large prints size A4 (21cm × 29.7cm) and A3 (29.7cm x 42cm). The prints are professionally printed on a vibrant silky gloss paper. 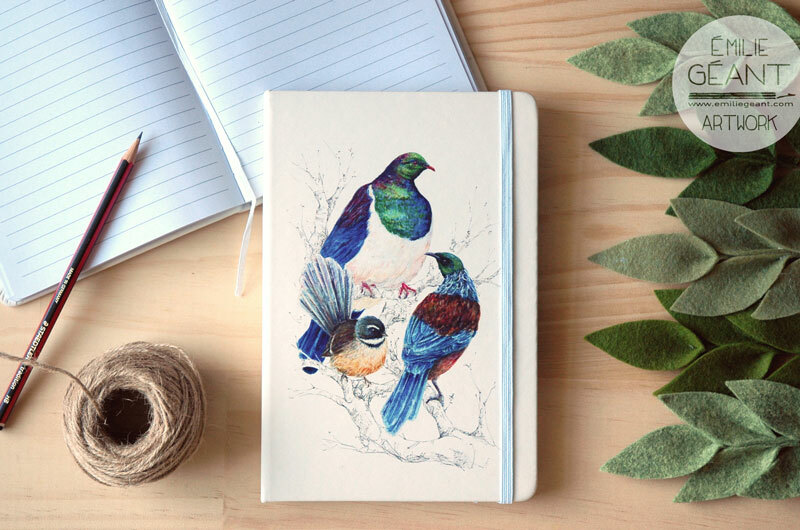 Smart medium A5 size, this notebook features my original watercolour and ink illustration of a Tui, a Fantail and a Kereru (or Wood pigeon), native birds’ trio of New Zealand. With 160 lined pages, a bookmark ribbon and an elastic closure band, it has a hard cover with a luxury soft touch Neoskin finish. 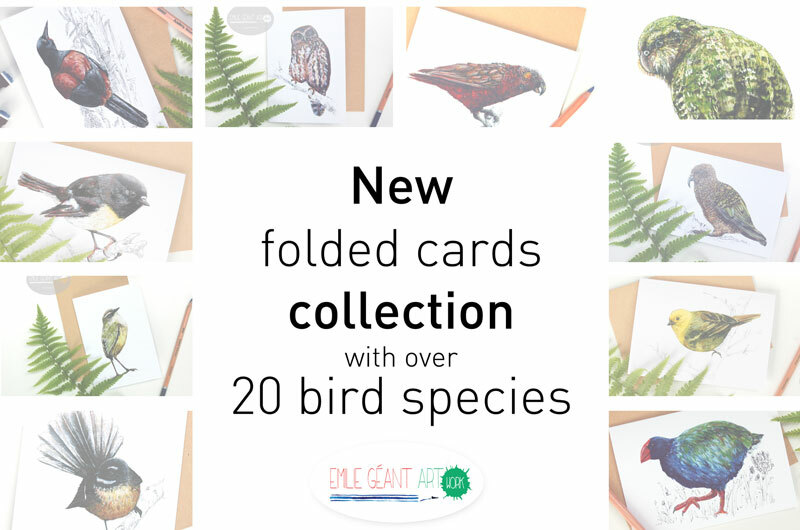 These A6 folded cards feature 22 of my original New Zealand birds’ illustrations. 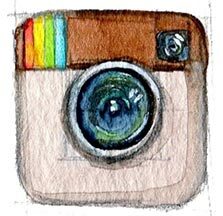 The original illustrations have been made on paper with ink and watercolour mainly. 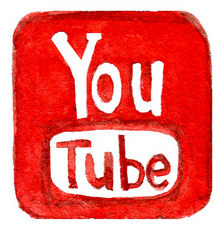 The cards are professionally printed on a 210gsm silk matt paper. The inside of the card is blank so there’s plenty of room to write a message. The back of the card has a small legend with a mention of the bird’s name. Caring for your prints and original artwork: To ensure the longevity of your prints, I recommend not to hang them in direct sunlight. Please email emiliegeant.artwork@gmail.com for orders/inquiries. Orders are confirmed once full payment is cleared. Prints will be held for 2 days only once payment instructions have been sent to customers. If you are not able to complete your order in that time frame, please contact me as soon as possible, otherwise, your order will be cancelled without notice. Processing time: The time I need to prepare an order for shipping varies. 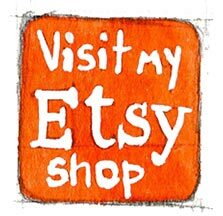 For items in stock, I usually ship orders within 1-2 working days after payment is cleared. For details, please email me. A4 and A3 Posters are sent a rigid envelope or a tube, whatever suits best. I take extra care to make sure your order arrive without any issue, however in case of damages caused in transport, please contact me within 24hrs of delivery. Note: I will not be responsible for damaged or lost parcels sent with no tracking/ no signature as I have no control over the shipping. This shipping is available only to offer a economic shipping and must be selected at customer’s own risk. 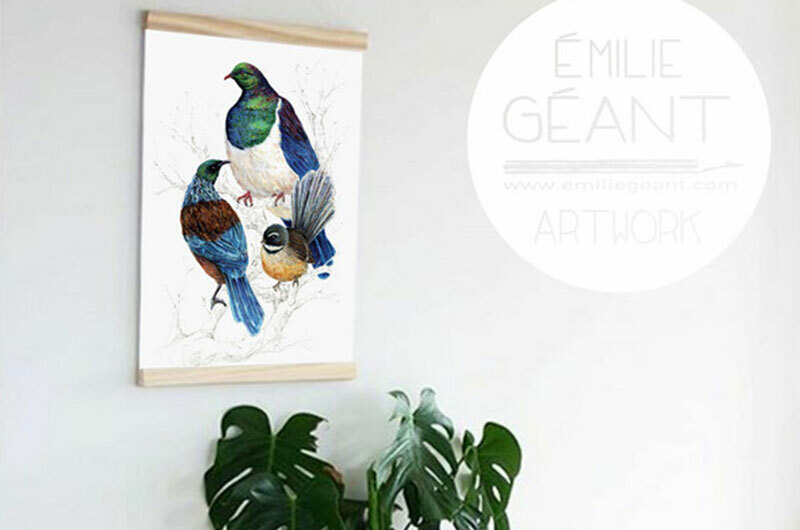 Payment is to be made in NZD with banking transfer into Emilie Geant Artwork’s bank account (BNZ). Bank account details will be provided for you to complete your order. I gladly accept exchanges, just contact me within 2 days of delivery so we can discuss an exchange. Ship items back to me within 3 days of delivery at your own cost. New items shipment will proceed when the return items are received in their original packaging and conditions. I don’t accept cancellations. No refund will be made. Conditions of Return: Buyers are responsible for return shipping costs. If the item is not returned in its original condition, the buyer is responsible for any loss in value. Buyers will have to pay for the postage and any additional charges for the new items offered as a replacement. If there is anything wrong with the delivery of your items, you need to contact me within 48hours of delivery. To receive a refund or replacement on items damaged during delivery, the prints need to be returned to the company in their original packaging. 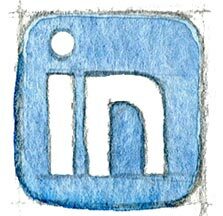 Inform you of sales and special offers.